Hemp Vs Marijuana | Their Differences & All You Need to Know - Happy CBD Oil! What do hemp and marijuana have in common? A hell of a lot less than you’d think. Despite the sea of misinformation online, many people continue to believe hemp and marijuana derive from the same plant. This of course is false – which begs the question – what makes hemp ‘hemp’ and marijuana ‘marijuana’? If you’re still scratching your head wondering “aren’t they the same?” then scratch no more as you’re about to find out why they’re two very different things. Unlike marijuana, hemp is a skinny-leafed plant that often grows up to 20 ft tall. It even grows alongside weeds in Nebraska making it somewhat common looking. On the other hand, it doesn’t take long for most people to recognize marijuana’s famous fat shaped leaves. Ever wondered if you can get high from smoking hemp? You’re about to find out. The main difference between the two species is their chemical composition. Tetrahydrocannabinol – also called THC – is the chemical in marijuana that causes users to get high. As a reference point, an average batch of marijuana contains anywhere from 5-20% THC whereas hemp contains a maximum of 0.3% THC. Translation: you’d have better chances of getting high from sniffing paint than from smoking hemp. And if you are – you’re spot on. Don your history cap, here’s a quick lesson. Back in 1970, Nixon fought the American drug war classing both marijuana and hemp as (temporary) schedule I substances i.e. the most dangerous substance group in the world. Interestingly, Nixon’s motivations were less about the good of the people and more about politics and race. Despite hemp’s non-psychoactive properties, Nixon still grouped it along with marijuana and it remained illegal until 2018. Hemp vs Marijuana: How Are They Used? Well, isn’t that the golden question. Both species serve completely different purposes. For example, marijuana is known for its medicinal and recreational purposes whereas hemp is a popular medicinal health supplement. You can smoke marijuana, inhale it through a bong, apply it as an ointment, consume it as a tablet and even drink it in a diffused liquid. On the other hand, hemp is found in skin products, health food supplements like protein bars and even is used as a fiber similar to cotton. Hemp is also used to make CBD, the cannabinoid which scientists believe may be what causes the healing properties of marijuana. Generally speaking, there are two types of people that use marijuana. 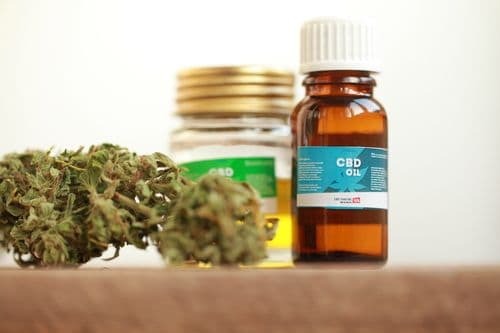 Those that enjoy the psychoactive properties of the substance will opt for a high percentage of THC while others in search of anxiety or stress relief will prefer CBD oil with a lower percentage of THC. Marijuana’s little cousin hemp – believe it or not – is actually a great alternative to cotton as it’s up to three times as strong. Clothing companies like Chiefton Supply Co even make T-shirts from a hemp/cotton blend as hemp requires less water than cotton to grow, therefore making it cheaper. Surprisingly, you’ll also find hemp tucked away in popular products like beer, sunscreen, shoes, rope and even fuel. Unlike her tame relative, marijuana has somewhat of a controversial reputation. That being said, it’s versatile in its own right. As a psychoactive substance, most people enjoy smoking it or vaping it. But the benefits don’t stop there, it can also be consumed (with less THC) in tablet form to treat depression and anxiety. This form of the substance is mostly sold as tablets, sprays, gummy sweets, confectionary and in health drinks. If that’s not enough, research has shown marijuana can kill cancer cells, help control ADHD, fight acne and even boost gut health. Due to changes in the law, CBD oil has now become one of the most popular health supplements available. Also known as cannabidiol, CBD is a popular natural remedy used for many common ailments like anxiety, stress relief, depression and pain relief. Unlike marijuana with a high THC content, CBD oil isn’t psychoactive, meaning you won’t get high from it. It’s very popular with a cult following for a reason. Athletes enjoy its anti-inflammatory benefits while students or those with stressful jobs enjoy it as a form of stress relief. It’s worth knowing CBD oil also helps epilepsy suffers manage seizures and even household pets with anxiety. Are All Hemp CBD Oils Useful? Poorly manufactured CBD can easily make you sick as it can contain harmful chemicals. For this reason, most CBD processed in China should be avoided. There are a variety of manufacturing processes depending on the concentration, purity, location of manufacturing and the price point. You should note that concentrations differ with highly concentrated CBD oils being the most effective (provided it’s of high quality). We sell low concentrated CBD and highly concentrated CBD (up to 5,000 mg per bottle) so you can try different strengths to find what works best for you. As a general rule of thumb, it’s best to opt for a trusted brand that’s manufactured in the United States. Hemp Vs Marijuana: Which Is Legal? Ultimately, the level of contained THC will decide the legality of a product. For example, the law varies from state to state with different states legalizing different levels of THC products. As of now, most CBD is legal in 46 states and our CBD is actually legal in all 50 states because it contains 0% THC. Cannabis Sativa Vs Cannabis Indica: What’s What? Again, another great question but first – here’s a quick history lesson. The names Indicia and Sativa were introduced in the 18th century to describe different species of cannabis. Sativa, named by Carl Linneaus, described hemp plants found in Europe and western Eurasia, where it was cultivated for its fiber and seeds. Indica, named by Jean-Baptiste Lamarck, describes the psychoactive varieties discovered in India, where it was harvested for its seeds and fiber. Indica strains are believed to be physically sedating – perfect for relaxing with a movie or as a nightcap before bed – whereas sativas tend to provide more invigorating, uplifting effects that pair well with physical activity, social gatherings and creative projects. Think of it like this; if you want to relax, then opt for Cannabis Indica. If you’re in the mood for an uplifting experience, then Cannabis Sativa is the solution. Sativa is tall in size with narrow leaves and is grown in warmer climates. Indica on the other hand is a great match for colder climates and is short in stature with broad leaves. Both indica and sativa cannabis strains contain THC & CBD meaning both plants can create CBD oil. Now – this is where things get interesting. Hemp is a form of the Sativa strain with manufacturers using the species’ seeds to create hemp oil. Hemp Oil contains no CBD or THC. Translation: it isn’t psychoactive – it doesn’t trigger a ‘mental buzz’ and is great for its nutritional benefits (omega oils, vitamins, etc.). It is not useful for as a CBD supplement though since it contains no CBD. That being said, its leaves and stalk contain much higher levels of CBD. These are the parts of the hemp plant used to create CBD oil. Each US state has a particular concentration of THC it allows to be present in a CBD product, which is why most manufacturers sell CBD oil with a lower % of THC as it can be sold in as many states as possible. As of now, CBD with 0.3% or less THC can be sold in 46 states. However, our CBD contains 0% THC making it legal in all 50 states. Think of hemp and marijuana as close (often confused) cousins. They’re similar, but definitely not the same. Despite the fact they’re made from two different plants, both species are loved by millions across the world for a plethora of reasons. If you haven’t already tried CBD oil, then today is the day to get started!